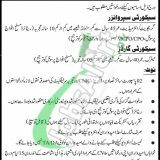 Here you will be having the latest career offer from Karachi Shipyard and Engineering Works Jobs 2019 Current Openings. For all those applicants who are seeking for the jobs in Karachi Shipyard and Engineering Works has advertised the recent job advertisement for which it is seeking to hire the well disciplined, calibre and adroit applicants are required to apply for the following posts given below. KSEW Jobs are (Security Supervisor, Security Guards). The recruitment against the above-mentioned positions will be held on contract basis which is further extendable as per the policy of Karachi Shipyard and Engineering Works Limited. The above posts need to be filled with Graduation/Intermediate/Matric in the relevant discipline with experience in the relevant field. Age limit should be 40 to 45 years is required. Attractive salary package will be given to the applicants with a beautiful environment. So, tap towards its applying criteria below. Karachi Shipyard and Engineering Works is the Federal Govt department also a military corporation which is performing number of the tasks such as catering for shipbuilding, ship repair and general heavy engineering and much more tasks are included in the list of its department. Being a Federal Govt department it offers Govt jobs of different educational level. Interested applicants are required to apply by sending the applications on plain paper along with detailed CV attested copies of educational certificates and experience certificates and latest passport size photograph should reach the following address given below. The last date for submission of application is April 29, 2019. Post applied for, must be mentioned clearly on the envelope. No TA/DA shall be admissible for appearing in Test / Interview. Last Date To Apply: April 29, 2019. Address: Karachi Shipyard and Engineering Works Limited West Wharf, Dockyard Road, Karachi.